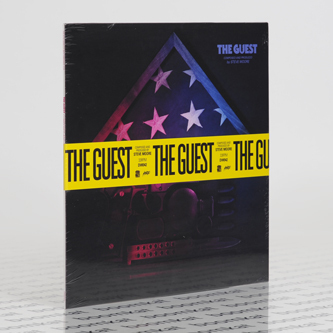 *Black Vinyl with printed inner sleeve and a 'do not cross’ obi strip* "Death Waltz Recording Company has yet another ace up its sleeve with the soundtrack to 2014's best action films, Adam Wingard's THE GUEST, with a musical score by Steve Moore. Critically acclaimed, the “guest” in question is David, a young man who lands on the doorstep of the Peterson family claiming to be a comrade of their son, who was killed while on tour in Afghanistan, But while David appears to a model citizen, the family daughter discovers several clues that make her wonder “Just who is this man?” Just like the film is a homage to 80's thrillers like THE TERMINATOR, Steve Moore's score belongs in another time, another place. Homaging rather than emulating, the music feels not only absolutely authentic but also fits the film like a glove. Great synth melodies are plentiful, the electronics swell with mystery and intrigue, and the sense of the robotic electro music has is perfect for the character of David. It's an intense journey but not one without reward – don't be afraid to let THE GUEST into your home and onto your turntable."